Istanbul is not only famous for its history but also provides many natural beauties to discover during your stay. Those who wish to know the city deeply, must spend at least a week in Istanbul but if you do not have much time to spend in Istanbul alone and want to discover the rest of Turkey in the remaining time, the most basic of the city can be seen devoting whole 3 days. In this post, you can find information on the most emblematic places of Istanbul for a foreign tourist and activities to do in Istanbul during your stay. For those who wish, we provide the service of tourist guide only - in Spanish or English - to discover at your leisure the most representative sites of Istanbul. PLEASE CONSULT by the contact form in the sidebar. One of the great attractions of Istanbul, is undoubtedly the famous Blue Mosque, also known as Sultanahmet Camii. 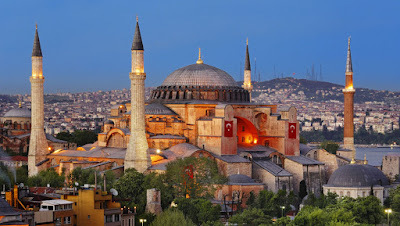 It is a huge mosque which is separated from the also famous Hagia Sophia by a square, Sultanahmet. Since her figure out recognize and contemplate a classic mosque, but such large dimensions, which are certainly few mosques. Also one of its main features is that still serves as the Muslim religious temple, and therefore kept intact its traditional essence. The story of this mosque takes us back to 1609, when during the best time of the Ottoman Empire, was ordered its construction. One of the greatest religious disputes that he remembered at that time, as this blue mosque was the only one who dared to have the same minarets of Mecca, which was the subject of angry criticism from religious authorities most important city for Muslims. We are above all a very impressive building indeed, once we understand the reason for the name "Blue Mosque"; It is the huge amount of tiles that exist in the whole architectural complex, mainly inside. We enter through any of its impressive arcades, taking into account that the entrance to the temple is free. Once we are on the inside of the mosque surely be impressed us with its incredible lamps are located at low altitude, the purpose of those inventories are so low was easier to replace the candles off. Another attraction inside the Blue Mosque is seen from within its large dome, it impressed that such a broad and practically no artificial lighting, the daylight is harnessed and give as much brightness inside the temple. Our visit will not be complete if we do not live visit from within a Muslim religious ceremony. Because once inside, and depending on the schedules of the mosque, we can enjoy the homily, which is given in Turkish, or the call to prayer is in Arabic, as mandated by the religious tradition. When we went outside, we will be in the courtyard of the mosque, a space surrounded by arcades and has exactly the same space inside the part. From this courtyard, which once was a gathering place, and even celebrations markets, we can see the whole mosque, getting a real idea of ​​the size of the enclosure. If you are interested in visiting the Blue Mosque in Istanbul, we will give you some essential tips to know it thoroughly without any problem. They are tips that have to do with the dress and its delivery within the precincts of the mosque. First you must know that we must take off our shoes to enter the mosque as required by Muslim tradition also is also very traditional to wash his feet and even bring your knees and shoulders covered, therefore omit excessively shorts and tank sleeves or "muscular". Beyond these precautions, we are convinced that your visit to the Blue Mosque will be an unforgettable experience. In fact, it is one of the most compelling reasons to visit Istanbul. You could say that is the most important monument to visit in Istanbul. It is located just enfrende of the Blue Mosque. It was built as a church and later was converted into a Muslim mosque and today is a tourist museum - one of the best preserved monuments of Istanbul. For more information with details of the Cathedral of Santa Sofia, you can see this article. Being the residence of emperores the Ottoman Empire until the construction of Dolmabahce Palace on the shore of the Bosphorus, the Topkapi Palace is of great importance in the history of the Ottomans and Turks. Topkapi Palace and the Haren thereof are some very interesting places in Istanbul. Here in this post, you can see more about Istanbul Topkapi Palace. underground which it is in the southwest area of ​​Santa Sofia. The room had the unique functionality (not unimportant) to serve as a water reservoir for cases in which there were drought and the city was under enemy attack. We are facing a truly historical work since it was built in 527 AD by Emperor Justinian I, though formerly this Basilica Cistern was a small chapel in the same way it was built centuries earlier. Once we enter the enclosure surprise us impressive dark marble columns among which we turn our gaze to the horizon and certainly lose track of the exact amount, which tells us that we have a huge dome of colossal dimensions. His showmanship has earned it the name "Sunken Palace". It is a work that surprises visitors both for its size (think it occupies a space of more than 140 meters long and 70 meters wide) and its incredible access (you enter through a staircase of more than 50 steps) and its impressive construction that makes hold more than 336 columns over 10 meters each. These columns are separated from each other by about five meters away, forming a total of 12 rows of 28 columns each, if I read it impresses, imagine knowing him personally. The play tells us that it was built with the utmost care, taking into account details such as materials, where columns of various types of marble were chosen and adopted a huge detailed millimeter worked capitals. Basilica Cistern, also houses beautiful sculptures from Roman times, especially highlighting known as "Medusa heads" of which the source is unknown. They are sculptures depicting the face and head of several women with hair braids formed by poisonous snakes, with a strong presence in the Greco-Roman mythology. This wonderful underground ship has undergone several restorations that have managed to arrive intact to this day, the first restoration was done in the eighteenth century in which, under the reign of emperor Ahmet access to the tank was modified and restored the main sculptures. Since the nineteenth century, there was a second restoration in which the basic structures of the tank is improved preventing deterioration result of land pressure. Basilica Cistern is a truly comprehensive schedule, and is open from Wednesday to Monday from 9am until 18: 30h, closing one day a week, on Tuesdays. Access costs 10 liras. The experience is really impressive, as during our tour of the Sunken Palace we put all kinds of relaxing music that will make the visit a very special memory for the visitor. For all these reasons, the visit to the Basilica Cistern is one of the best experiences you can live in the city of Istanbul. For many people, going into this beautiful space is immersed in another world, a more peaceful, quiet and a world full of mysticism and great stories of a city like Istanbul world. Our visit to the city of Istanbul will not be complete until we visit the Grand Bazaar. The same is the largest and most characteristic market in town, and also one of the oldest in the world. But not only impresses with its size, but also for the products it traded for the colorful stalls, the art of negotiation from sellers and buyers where haggling is a way of understanding and trade the traditional essence of a market that is resigned to losing its identity and remains intact well into the twenty-first century itself. We have a huge trade area of ​​over 45 thousand square meters where about thirty thousand merchants carry the noble profession of selling and buying products of all kinds. It is a place that is subject must see for locals and for visitors. It is estimated that about half a million people come daily to this immense space commerce. It was founded in the time of Mehmed II, just after the conquest of the city from the Byzantines and since this market was gaining weight in the daily life of the city of Istanbul, growing number of shops and streets were covered by the Office of the sale, then also the walled enclosure. The Grand Bazaar, had a hard time since it was ravaged several times by fire and flood, which has overcome while the market itself grew. In addition to the trades to buy and sell handicrafts, carpets, clothing or pottery, it is also an ideal place to eat traditional dishes of local gastronomy space. Among the most curious facts of this market is the name of the streets of the same, as each street has the name of the item being sold in stores on that street. The products most purchased by visitors are fruit, vegetables and food in general, as well as carpets, handicrafts, paintings, ornaments and clothes of all kinds. It is not a cheap market too, if we get reasonable prices will have to haggle point to be discussed in the next section. The first advice I give is to have clear early if you want to buy exactly what you want to buy, because in this market have spent centuries perfecting the art of selling, making sellers speak almost all major languages ​​of the world and They know perfectly how to sell any product without much effort. The first tip is to say "no" when appropriate and if we are interested in a product is mandatory haggle as much as possible, because in addition to paying much more expensive things, if we did would be considered bad taste for tradition traders. As for bargaining, there are no set rules, only the art of selling and our shame are the limits to this traditional way of closing deals. In most stores will offer us tea, acceptance is not binding on acquiring the product offered, so we should not feel obliged to accept it under any circumstances. Undoubtedly, the Grand Bazaar is one of the most important traditional retail spaces around the world. His visit is somehow a stimulus of great magnitude to our senses as the smell of food, the beautiful textures of the carpets, the bustle of the negotiations of sellers and potential buyers will be the keynote of a visit will not forget ever . One of the most charming places in Istanbul is its famous Spice Bazaar. It is one of the largest covered markets in the country, along with other Istanbul market; "The grand bazaar". Many visitors only know the Grand Bazaar, whose largest and most internationally renowned tourism takes. However, the Spice Bazaar is equally advisable to be a great tour for visitors. Because in addition to its spectacular, the Spice Bazaar is also one of the oldest commercial spaces around Istanbul since its construction began in the early seventeenth century with the purpose of selling in the city spice throughout Asia and Africa. He was a famous international market as they could in good price to buy all kinds of medicinal herbs, aromatic herbs and spices for cooking. In fact, thousands of traders from all over Asia and Europe were moving to acquire the raw materials that then resold in various shopping malls. As most of the products came from the area of ​​Egypt, this market was known on many occasions as "Egyptian Bazaar". As mentioned, the construction of this building was ordered in 1600 by order and express wish of Hatice Turhan, mother of Mehmed IV. The construction of this market was due to economic reasons only, namely to financially support the New Mosque. Over the centuries, the market was expanding and offering more products. Specifically, the Spice Bazaar has over six innings and ochentaycincotiendas where we can buy all kinds of spices, teas from all kinds of herbs, through nuts, meals throughout Turkey and Asia, aromatic seeds, traditional sweets Plants with miraculous properties, coffees from all over the world and especially the famous "Turkish coffee". But besides spices, Bazaar also hosts a number of other positions in which we acquire both embroidery and ceramics, traditional pottery, lamps, rugs and all types of decorative utensils. Like any good bazaar, also it has a dining area, and this is where the most typical flavors and smells of the city are made with the atmosphere of the street in a really unique experience. Hit the market is very simple, it is in the neighborhood of Beyazit, Eminonu, right next to the Gálatasituado Bridge, which is located in the east of Sultanahmet area where we can find the old city. It is a particularly important area for trade because we can find the Grand Bazaar and religion, as home to the Beyazit Mosque and Beyazit Tower. Therefore, we can use the visit to the Spice Bazaar to take a tour of the area. Moreover, as it is located near the Bosphorus, we are also very close to the area along the banks of the Bosphorus where we can choose from a variety of traditional restaurants where you can sample a huge number of small tastes of Istanbul in a frame simply incomparable. Galata Tower is a building nearly 67 meters high, which was built in the fourteenth century and for more than two centuries was a watchtower and defense of the wall covering is maritime area of ​​the ancient city of Galata . La Torre has stunning nine stories high, a fact that earned him be the tallest building in the city for several centuries. During construction pioneering architectural techniques were used at the time, the result of this fact, this tower has endured trouble a lot of earthquakes. By their nature, the Galata Tower was the most appropriate place to control the entire area where the Bosphorus meets the Sea of ​​Marmara and the area known as "Golden Horn", not only during the Genoese period, but also during the time of the Ottoman Empire. La Torre, was the most significant building of the "Podesta Galata", which was an ancient city-state that was nourished mainly Genoese trade and where the economy was flourishing at any time of year. This ancient city was history after the conquest of the Byzantine capital by Mehmet II, where he was integrated into the new city of Istanbul. Galata after this fact became one of the most multicultural and bohemian neighborhoods of the city. One of the most amazing facts is that despite the passage of centuries, this multiculturalism remains today, as this area of ​​the city is famous for hosting all kinds of street theater in which the mixture and colorful Muslims Jews and Christians is the dominant note. Proof of this is that during weekends, around the tower (note that it is the main focal point of the neighborhood) all kinds of musicians and artists congregate in exchange for a few coins or often "for art's sake" share with visitors its magic and culture. It is recommended a visit more than worth paying six euros worth entering the premises. Climb up to the ninth floor elevator, and finally continue along a steep spiral staircase to the viewpoint. Once at the highest point of the tower, nothing better than to sit and contemplate the beautiful dome from the amazing viewpoint. As to the ninth floor, it also has one of the best panoramic views of the Bosphorus we can have in the city. Cover, and fitted more than 51 meters high, from this plant can take a traditional and delicious tea for very little money. During this tea, we can see almost the entire city of Istanbul, both the Asian and the European side, can have a perfect view of both Santa Sofia Mosque as the Blue Mosque and the lower part the Galata bridge. Certainly, the ideal time to visit the Tower is the late afternoon as they see the illuminated tower is one of the best experiences we can give to our eyes and our spirit. At the door of the current Acropolis Museum Chora is located, was in ancient times an important church in its original language is called Kariye Müzesi. "Chora" means "outside the walls" was so named due to be raised, then, outside the city walls of Constantinople. He joined again to the city when Theodosius 'the Great', rebuilt the walls, thus leaving the inner portion of the periphery, this was possible because he was the one who established Catholicism as the official religion here.This ecclesiastical complex has been one of the most widely taken to complete to be built, it is said that began under the mandate of Justinian (important governor of the eastern Roman Empire who was also called "the last emperor") in the year 413. But due to the vagaries of history, is re-started from between 1077 and 1081. However there was a great earthquake that destroyed much of it, where they had to start its reconstruction in 1316, which ended 5 years later. For several years he was a mosque that received hundreds of practicing Catholics, this made them all the pictures, including the bell were covered by plaster and removed, respectively. The latter place was taken by a minaret, typical of the Muslim religion.From now on I go through many restorations, so he spent closed several times. The last time, after being repaired for 10 years, let him open its doors to the public only in 1958, allowing visitors to admire its interior decorated with stunning paintings, mosaics and frescoes dating from the sixteenth century created by great artists of the time Byzantine, the author of the latter was specifically Metokites. The generating amazement and sometimes disconcerting, is due to the perfect condition of these works, in addition to its content, a mix of Byzantine worship and words of the scriptures. Therefore it is possible to see that they are represented biblical characters like Jesus and his mother Mary, and reported in the Gospel as the resurrection of Christ and the Last Judgment facts. Besides iconography of the Old Testament. The time in which you can visit from 9:00 to 19:00 from Monday to Sunday during the months of April to October and from November to March 9:00 to 19:00, but on Wednesday only to 17:00. The trip can be a bit complex because it is removed from the center of Istanbul. But it is advisable, to get to Chora, go to Beyazit and Eminonu and take one of the following lines 38E, 37E, 31E or 36KE to the stop marked as Edirnekapi, from there 200m walk (from where you can They see) in time they are approximately minutes. That if there are fees, it costs about 5.50 euros or 15 liras. Is the palace was built between the years 1843-1856. After the contruction of the Dolmabahce Palace, Topkapi palacip which was the main palace of the Ottomans, he was abandoned and the family moved to Dolmabahce sultantenes. It is also the place where the great leader of the Turks and the founder of the secular Republic of Turkey; Mustafa Kemal Ataturk spent the last years of his life and died there. The Dolmabahce Palace in Istanbul Kabatas with a wonderful view of the Bosphorus. Today, the presidential office is also in the palace but still a tourist museum. Istanbul is a city that is characterized by a very important past, fact that certifies both the many historic monuments that the city of mosques and the great heritage that lies in the many museums of history available to the city . In the case of the Archaeological Museum of Istanbul it is more than a conventional museum as we could say that we have a macro-complex formed by both the Museum of the Ancient Orient, the Çinili Kösk, the Tile Museum and archaeological. They are part of the known as "complex of museums". Specifically, we will refer to the Archaeological Museum of Istanbul. It is one of the most important in Europe. It is an institution with a long track record since it was founded by a great painter and Turkish archaeologist named Osman Hamdi in 1891. At first, the museum consisted of a small collection of antiquities, however, little by little, the public and private efforts were getting expand the collection to establish it in one of the most important archaeological level around the old continent. In fact, today it is one of the five best archaeological museums internationally, a fact that shows the great importance of this institution. The large collection of archeology museum consists of three distinct branches. First some objects of archeology in general, which include some items like the collection of sarcophagi. Secondly there is an incredible collection of Oriental art objects, but also graves of Ottoman origin and other objects of civilizations as diverse as Egypt, Chinese or Sumerian and many others. Finally, and perhaps one of the most impressive is the collection of ceramics and jewelry. It is located in another building, the Blue Jays, in addition to the collection is worth by the building itself, which was built by Mehmet II.